Theresa May has been dealt an ultimatum by her divided cabinet as she attempts to find a new Brexit plan – with pro-Leave ministers warning her not to water-down the deal. The Prime Minister has been told by Brexiteers she ‘risks splitting the Conservative party’ if she compromises and tries to gain Labour’s support for her plan. Mrs May has also faced questions from pro-EU ministers who want to vote on legislation that would mean Brexit isn’t possible on March 29 without a deal. Labour’s conditions of support include pursuing a permanent customs union with the EU and removing the threat of leaving without a deal – which some Tory MPs would not be happy with, reports the Financial Times. 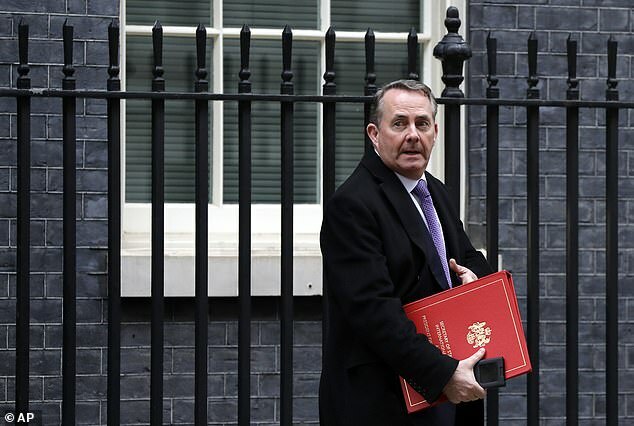 The ultimatum comes after a meeting at Downing Street on Friday where International Trade Secretary Liam Fox, the Leader of the House Andrea Leadsom, and Home Secretary Sajid Javid are thought to have been present. 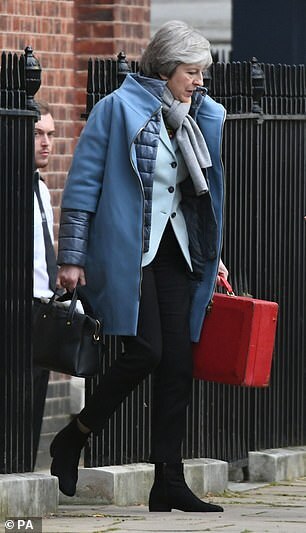 Mrs May held a series of meetings with members of her cabinet yesterday, however she she did not intend to speak to any opposition, reports the Guardian. 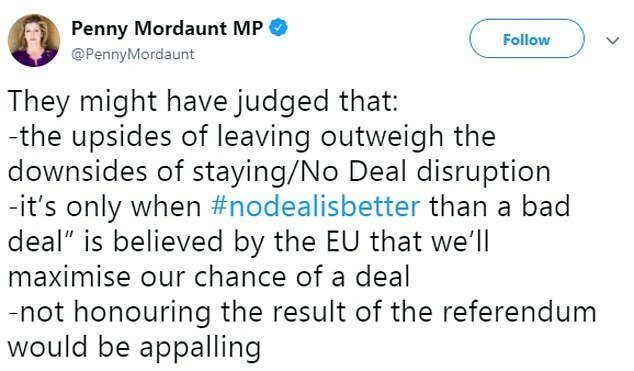 Aid Secretary Penny Mordaunt – a Brexiteer – went public in defence of crashing out of the EU on Twitter- arguing it is better than accepting a bad deal. 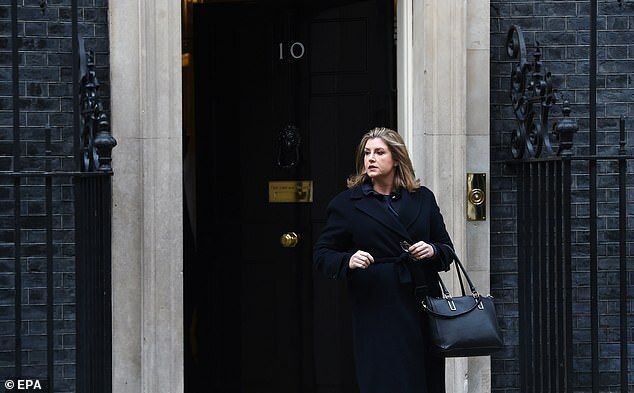 Ms Mordaunt insisted today the EU had to believe a no deal Brexit was still an option to win new concessions from Brussels and make the deal acceptable to Tory rebels. Before the meetings, Ms Mordaunt replied to a tweet by Times columnist Hugo Rifkind questioning support for no-deal among Thursday’s Question Time audience. Mrs May faced rejection in the commons earlier this week when she was defeated by 230 votes – the biggest for a government in history, outstripping Labour in 1924. However she defeated Jeremy Corbyn’s no-confidence motion by 325 votes to 306 after the DUP and Tory Brexiteers came back into the fold despite dealing her a humiliation on her EU deal the night before. EU officials have said they will not reopen talks on the deal until the government has worked out what could be approved in commons. This has sparked meetings within her divided cabinet to try and work out a way to get an agreement made. Jeremy Corbyn has also reaffirmed his refusal to meet Mrs May for talks to discuss the way forward unless she takes the possibility of a no-deal Brexit off the table. The Labour leader said the talks were ‘not genuine’ after No 10 made clear she would not accept a customs union with the EU. He said this measure was ‘necessary’ for any new proposal to command the support of Parliament. In a letter to the Prime Minister on Friday evening, Mr Corbyn, the only Westminster leader not to meet her, also complained she had ruled out any extension to the Article 50 withdrawal process or a second referendum. ‘Whatever one thinks of those issues, that reinforces the view these are not genuine talks, but designed to play for time and give the appearance of reaching out, whilst sticking rigidly to your own emphatically rejected deal,’ he wrote. His intervention came as it was reported that pro-Brexit Cabinet ministers had warned her she risked splitting the Conservative Party if she gave way to calls for a customs union. She told the paper: ‘No deal is not the desired outcome, but it would be incompetent for any responsible government to rule it out, and there are very good reasons for that. While the Daily Mail reported that Jacob Rees-Mogg, chairman of the Leave-inclined European Research Group said no deal was better than Mrs May’s deal, but Mrs May’s deal was better than not leaving at all. 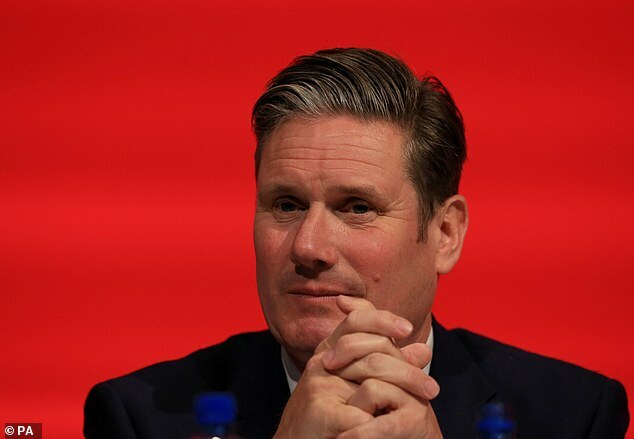 Shadow Brexit secretary Sir Keir Starmer is set to say there are ‘no easy routes’ out of the current crisis. In a speech to the Fabian Society new year conference in London on Saturday, he will say it is now up to Parliament to take the ‘difficult decisions’ needed to end the impasse. In his speech, Sir Keir will lay the blame for her dilemma squarely at Mrs May’s door, accusing her of having offered the country ‘false hope and false promises’. ‘It’s now time for an open and frank debate about how we break the deadlock,’ he will say. ‘There are no easy routes out of the mess this Government has got us into on Brexit. ‘Difficult decisions are going to have to be made by Parliament. Earlier Tory MP Nick Boles warned ministers were ready to resign if the Government tried to block moves to give MPs the power to block a no-deal Brexit. In an interview with the BBC Radio 4 Political Thinking podcast, the former minister said their was a growing bandwagon behind plan which could enable parliamentarians to demand Article 50 is extended to allow fresh talks with Brussels. 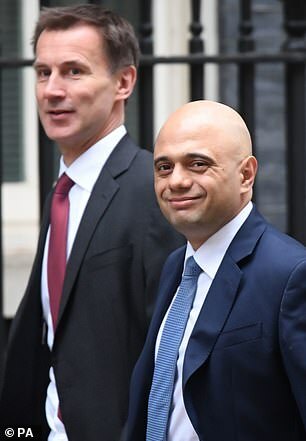 ‘We have had indications that many ministers, including Cabinet ministers are very, very keen to see it pass and are telling the Prime Minister that they will not vote against it,’ he said. 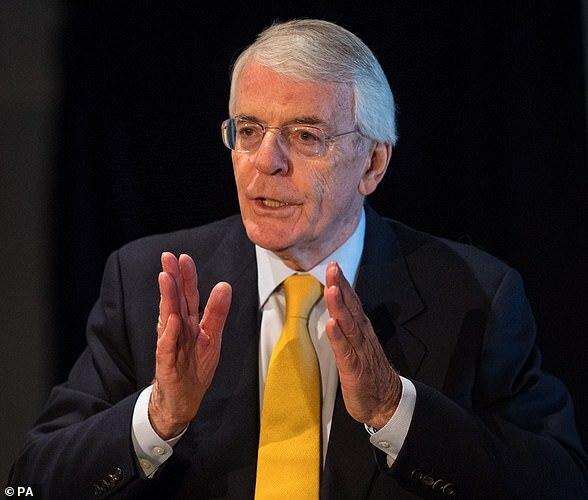 Sir John Major has called for MPs to be given a free vote on the way forward on Brexit to break the deadlock in Parliament. The former prime minister said that following last week’s crushing defeat in the Commons it was clear that Theresa May’s deal was dead. He urged her to stage a series of ‘indicative’ votes to enable her to establish which, if any, of the alternative proposals could command a majority. ‘The Prime Minister argued valiantly for her deal. She fought for it but the House of Commons killed it and killed it comprehensively,’ he told the BBC Radio 4 Today programme. Sir John, whose premiership was riven by divisions over Europe, said that ideally all the party leaders would give their MPs a free vote to allow an ‘honest representation’ of opinion in the House. ‘It is the only way to get an absolutely honest answer from Members of Parliament and if it is a free vote it removes the danger of resignations from Government or the opposition frontbench because they disagree with their leader’s policy,’ he said. ‘If there is a whip, many Members of Parliament would follow the whip out of loyalty to their party or their leader rather than loyalty to their conscience or their constituents. ‘This is such a unique issue I think it would be an act of statesmanship by the party leaders to say ‘Because of the very strong opinions on either side, we are going to lift the party whips so Parliament and the country can get a genuine view of what it is Members of Parliament most think would be best for our country or, perhaps, least bad for our country’. Ms Braverman, a former chairwoman of the pro-Leave European Research Group of Tory MPs who resigned as a Brexit minister over Mrs May’s Withdrawal Agreement, called for the Irish backstop to be scrapped. She said some of the options being put forward, like a customs union, allowing continued free movement of people or holding a second referendum, would be ‘clear breaches’ of promises the PM had made and would ignore the will of the people. She said they would also have ‘severe consequences’ for the Tory party, but she stopped short of saying she would resign the party whip in protest. Fellow Tory MP Anna Soubry, a prominent Remainer in the party, in turn reacted with ‘despair’ to Ms Braverman’s comments, accusing her of being ‘rude and living in a Brexit fantasy land’. Ms Soubry praised Sir John for offering a way forward.